Handsets are normally configured through provisioning. 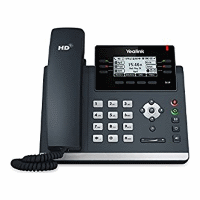 V80 or above is needed for Yealink handsets to support uaCSTA. Please contact us for more details or speak to your Yealink distributor. Handsets are configured to point to the CTI server. uaCSTA handset are normal SIP handsets that are configured to connect to a uaCSTA server over SIP also. The uaCSTA session is only used for monitor and control the main SIP accounts Line 1. Firmware 80,81,82,83 *84 is not supported. Example = 76.82.0.20.rom .82 is the firmware version.